Although we do not make “one-offs”, Nazeing Glass Works is often asked to produce bespoke glass products for special projects, both in the UK and abroad. Most pavement lenses are standard sizes available from stock, but we can also undertake special projects, typical of which was being asked to make the glass for is the Bridgwater “ropewalk” in Somerset. 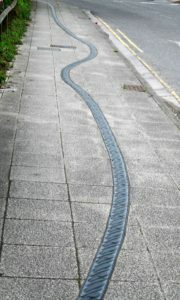 Inspired by the town’s maritime history and the old rope works, the project involved the manufacture of hundreds of special blue/green glass paviors, which were set into the pavement to form an illuminated trail from the retail park to the town centre. As well as making newly designed products, Nazeing Glass is also used to reproduce the original glass blocks or light fixtures that need to be replaced during heritage restoration jobs. Projects where Nazeing manufactured glass has been used include the restoration of Victoria Baths in Manchester, Savoy Hotel in London and Eltham Palace in Kent. In many cases where a standard product is unsuitable, Nazeing Glass can often help.